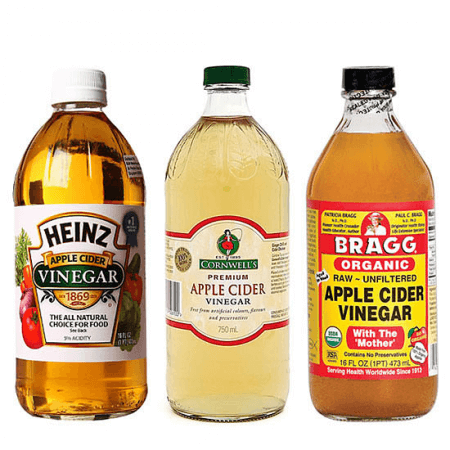 If you Google “apple cider vinegar” you will probably get thousands of results which list the different ways you can use it for your health, beauty, and household cleaning. Knowing that a bottle of apple cider vinegar comes with numerous benefits is great until you realize that you don’t have it! 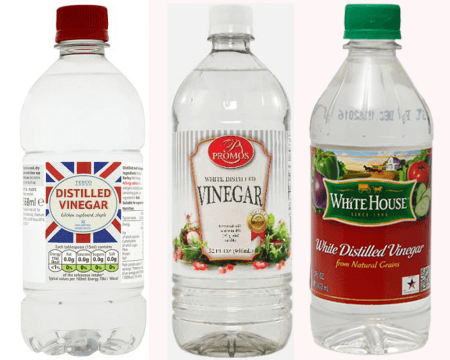 Not all of us have a bottle of apple cider vinegar in our kitchen, but most of us (if not all) surely have a bottle of distilled vinegar in our cupboard. The question is: are they interchangeable? This article will discuss the difference between apple cider vinegar and distilled vinegar. Apple cider vinegar or “ACV” is a type of vinegar that is produced by crushing apples to extract the liquid. The liquid goes through a 2-step fermentation process before it turns into vinegar. First, alcohol fermentation is the process where yeast and live bacteria are added to the liquid to turn the sugar into alcohol. Next, the liquid goes through another fermentation to turn the alcohol content into vinegar. If the product is organic, the result is usually murky and brown because it contains the “mother” (the cobweb-like particles). Non-organic ACV is usually pale yellow to clear amber. It has an acidic, sour taste with a hint of apple flavor. Apple cider vinegar is a versatile product. It is widely used to make vinaigrettes, chutneys, marinades, and salad dressings. It is also used to pickle fruits and vegetables and to flavor food. Unlike regular types of vinegar, apple cider vinegar is believed to have healing properties and more health benefits. In fact, it has been used in ancient folk medicine to treat different kinds of illnesses. Apple cider vinegar is believed to lower blood sugar levels, promote weight loss, lower cholesterol, provide relief for diarrhea, soothe a sore throat, clear a stuffed nose, and help remove dandruff. Many people also use it as a facial cleanser or mouthwash. Additionally, many homemakers use apple cider vinegar as a chemical-free cleaning product. It can be used to get rid of mold, remove wax, clean the toilet and tiles, and even unclog drains. It can be used on fabrics, but it should be diluted in water as it may leave a stain. On the other hand, distilled vinegar is a type of vinegar that is derived from corn. Although it is called “distilled” vinegar, it actually does not go through distillation. Instead, it goes through fermentation of distilled alcohol. The corn is mixed with water and then fermented to convert it to alcohol. The liquid then goes through a second fermentation process, and then a final filtration process. The result is a transparent liquid with an intense, sour taste. Distilled vinegar is widely used for cooking and baking. It can also be used to preserve meat, fruits, and vegetables. Aside from its culinary uses, distilled vinegar is used by many as a natural household cleaner. It does not leave stains so it’s perfect for cleaning fabrics, carpets, and other surfaces, including windows. It also removes odor and is great for cleaning the fridge. What, then, is the difference between apple cider vinegar and distilled vinegar? Apple cider vinegar is made from apples. The liquid extracted goes through a two-step fermentation process to convert it to vinegar. On the other hand, distilled vinegar is made from corn which is mixed with water. The distilled grain alcohol is then fermented and filtered. Organic apple cider vinegar is usually brown and murky and non-organic apple cider vinegar can be pale yellow or amber. It has an acidic taste with a hint of apple flavor. On the contrary, distilled vinegar is clear and colorless. It has an intense sour taste. Moreover, apple cider vinegar is famous not only for its culinary uses but also for its health benefits. Many people use it to lower blood sugar levels, promote weight loss, lower cholesterol, provide relief for diarrhea, soothe a sore throat, clear stuffed nose, and help remove dandruff. It can also be used as a facial cleanser or mouthwash. It can be used as a household cleaner but it is important to note that it leaves stains on some surfaces. Distilled vinegar, on the other hand, can be used to clean many types of surfaces because it does not leave stains. It is also great for cooking, food preservation, and baking, although its taste can be overpowering.